Okay, so the header paints this in a negative way.. but it isn’t! It’s supposed to be a pun on the whole story. It just sounds wrong. The “E” in “E-Relevant” is referring to the e-reader / e-book, because Tony Martin has compiled his scribblings from his now defunct site The Scrivener’s Fancy and compiled them into a fancy virtual binding e-book. After having two books physically published Lolly Scramble (2005) and A Nest Of Occasionals (2009), Tony had started a website to publish his weekly scribblings The Scrivener’s Fancy from 2009 to 2011. Alongside his regular stories, many of his close friends wrote for the site – such as Andrea “I’ve Never Heard Of Nickelback!” Powell, Matt Quartermaine, Garry McCaffrie, Tony Wilson, “Let’s Startle” Bob Franklin, Robyn Butler, Wayne Hope, Shaun Micallef, and pseudonym “Avril Rolfe” Sarina Rowell, along with other ‘guest Scriveners’. Just to name a few. There were a lot more. With the popularity of the site and what appears to be heavy in reading content, Tony has gathered his writings and combined them together as an e-book called Scarcely Relevant – Writings from The Scrivener’s Fancy – formatted and available in pdf / epub / mobi format, on his new site TonyMartinThings.com for a brain-snapping bargain basement price of AU$6. Covering roughly 464 pages of ‘lowbrow commentary in elegant surrounds’ (which translates to 1.293103448275862 cents per page), you can re-live the site that made you laugh every Wednesday once a week when you weren’t checking out the Green Guide letters or vandalising Wikipedia. You can read the e-book on your computer as PDF, or transfer the files to read on your smartphone or e-reader. After purchasing the book, the cash register goes through PayPal security, in which you need to use some type of credit or online debit card. Make sure you use a legit e-mail address, as once the purchase is done, you will receive a disposable link that will give you a time frame of downloading the format to your liking. Roughly 1 – 2MB for the book, it sure is cheap, but it’s not nasty and downright boring! 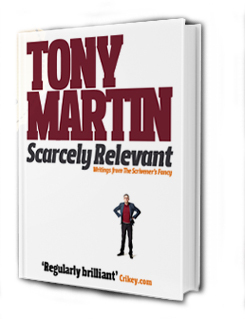 Purchase the e-book here: Tony Martin Things. Only available on that site too, so no lending Fleety $20, because it’s only $6.